If you’re new to the Mac or Apple platforms, learning the menu keyboard symbols that appear in the menus and on some keyboard keys, can be a little daunting. 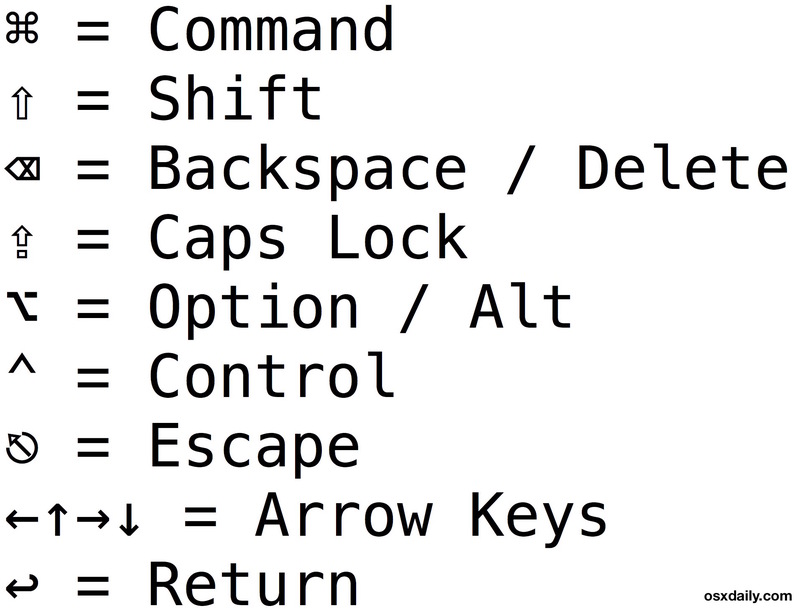 Nonetheless it’s not too complex, and knowing what the Apple keyboard symbols mean and what keys they stand for to access the function is essential for accessing various shortcuts throughout Mac OS X and iOS. 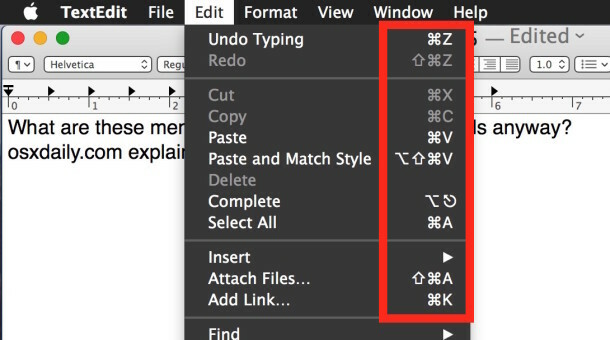 Not only do the Mac menus use the symbol short form as seen in the screenshot, but many websites will refer to the symbol rather than the text printed on the keys (⌥ instead of Option, for instance). Refer to the graphic at the top if you’re currently on a Windows machine or Android, as the above symbols sometimes only render on Mac and Apple devices. This little hand cheatsheet below can be printed out if you want to access and reference the Apple keyboard symbol explanations often, click the image below to launch a large version into a new window to print or refer to as needed. Thanks to Pat for suggesting this tip and sending in the list! I stared at it for a long time before I got what the symbol was. It is like a train track that breaks off to the right. It would be a straight line (a non-alternative click) but instead, by pressing the Alternat (ALT) you are changing lanes, so to speak. That may not be it at all but it makes sense to me. And yes, the symbols should also be on the keys. And the key “fn”. On the it laptops it activates the “F1-12” keys. All of these symbols are listed with their explanations in System Preferences/Keyboard/Keyboard/Modifier Keys, & always have been, BTW… You can also change them their if you want to. Clarification of Backspace/Delete icons: “Backspace” removes the letter before the cursor, and that icon there is correct. But “Delete” (also called “Forward Delete”) removes the letter AFTER the cursor, and looks like the mirror image of the “Backspace” icon: ⌦. On the laptop, you can accomplish this by pressing Ctrl-Delete which will do forward-delete. Maybe the next time you write an article about symbols on a Mac keyboard you could talk about the whole row of symbols at the top of the keyboard? What do the sun symbols at F5 and F6 do?